This is the 2006 draft summary of global challenges. You will get the newest version of the summary here. 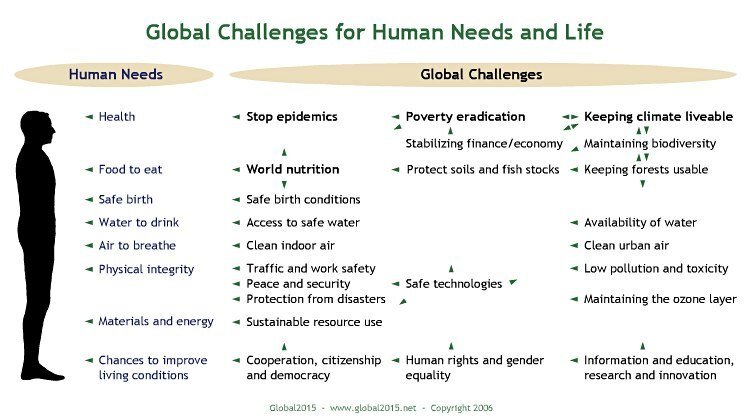 This is an overview of the most urgent global challenges for human needs and life. All these challenges are of existential importance for human life, and deal with overcoming large-scale damages and/or risk factors for many people. The issues addressed are caused or heavily influenced by humans. However, the individual consequences for the affected people are less due to their individual behaviour, but more due to larger-scale human activities. Cases of diseases that can be considered to be causes of natural death in old age are not a subject here. 38.6 million people are suffering from HIV (Human Immunodeficiency Virus)/AIDS (Acquired Immune Deficiency Syndrome), with 2.8 million dying in 2005. More than 360 million people are newly infected by tuberculosis or malaria per year, killing 2.8 million annually. (UN [United Nations] 2006, 14f. ; WHO [World Health Organization] 2004, 120). Africa is affected the most. In the Millennium Declaration of 2000 the United Nations set the target of stopping the spread of HIV/AIDS, malaria, and other major infectious diseases by 2015 (UN 2000, § 19.4). The rise of HIV/AIDS has been slowed down by huge efforts, TB (tuberculosis) is stagnating, while malaria is on the rise. It is still possible to meet the Millennium Target by continuing the successful extension of measures: information and antiretroviral therapy against HIV/AIDS (increased fivefold up to 1.3 million – but still only one of five gets treatment; UN 2006, 24), anti-malaria bed nets and insecticide use, new treatments against TB and malaria. In order to do so, in 2008 financial support of 22.1 billion US dollars will be needed (UNAIDS [Joint United Nations Programme on HIV/AIDS] 2005). Furthermore, there are new risks of resistant viruses and diseases like Avian flu to be contained. Those global risks are characterized by very large potential damage but also by uncertainty about the probabilities of occurence. (WBGU [German Advisory Council on Global Change] 1998, 62). One Millennium Target of the United Nations is to halve the proportion of people living in extreme poverty by 2015, measured from the base year of 1990 (UN 2000, § 19.1). This target will probably be met on a global scale, but not in every country (WB 2006, 66). Poverty reduction strategies should be continued or intensified, for example microcredits especially for women, fair trade, and employment initiatives especially for young people. Man-made climate change will probably include the increase of global temperature by between 1.4°C (degree Celsius) and 5.8°C by 2100, also increasing thermal extremes and weather disasters, changes in the dynamics of disease vectors, affecting agricultural crops and biodiversity, sea-levels, ocean currents and freshwater supplies, etc. (IPCC [Intergovernmental Panel on Climate Change] 2001, 8f.). Climate change affects all current 6.5 billion people, especially those in coastal zones and less developed countries. WHO has estimated the number of deaths caused by climate change to be 154 000 in 2000, increasing in the future (WHO 2002, 72). The economic cost of disasters associated with climate change reached 83 billion $ in 2005 (Munich Re 2006). A linear climate change is considered to be a risk with a quite high extent of damage and a quite high probability of occurence; non-linear changes (e.g. [for example] destabilization of ice sheets or ocean currents) have a higher extent of damage but unknown probability (WBGU 1998, 62). More than 30 industrialized countries have committed themselves to reducing their greenhouse gas emissions from 1990 to 2008-12 by 5% (Kyoto Protocol, UNFCCC.int). Scientists demand halving the emissions by 2050. However, global emissions of CO2 have, by 2003, already increased by 18.7% (UN 2006b, 12). Also for the sake of cost-effectiveness measures should be intensified, including climate protection and adaptation efforts such as: strengthening energy efficiency, energy saving and renewable energies, emissions trade, plane ticket tax, technology transfer, protection of coastal zones, public health, etc. The base year of all target data is 1990, unless otherwise indicated. The various connections between, and overlapping of, the global challenges only can be indicated here. They will be more precisely described in separate pages on the specific global challenges. Available data on global conditions are almost all of low precision. Most data on the largest problems of mankind rely only partially on actual measurements of specific cases, and often on estimates based on modelling and extrapolation. So the data base is far away from the motto of the WHO Report 2005: Make every mother and every child count . One of the UN Millennium Goals strives for debt relief for heavily indebted poor countries, and a cancellation of all bilateral debts (UN 2000, § 15.2). Initiatives for debt relief for poorer countries amounting to 59 and 50 billion $ were started in 1996 and 2005, which should reduce the annual debt payments by about 1 billion $ each (UN 2006, 23). Debt problems induced the Argentina crisis, amongst others. Other poorly secured financial transactions induced the Asia crisis and the dying of dot-coms. Debt relief and a far-sighted regulation of financial markets could reduce risks for economic and social development. Biodiversity includes diversity of species, habitats and genes. It is important for stability and adaptability of ecosystems and it is in increasing demand as a source of medicines and other commercial material. 12% of bird species, 23% of mammal species, and at least 32% of amphibian species are threatened with extinction (MA [Millennium Ecosystem Assessment] 2005). The global risk of anthropogenic affects on species has a high potential for damage, but an unknown probability of occurrence (WBGU 1998, 62). Agricultural expansion, including seeding very few crop species and using pesticides, is one of the major drivers of biodiversity loss, as well as nutrient pollution, climate change, and the invasion of species caused by global transport and travelling. The United Nations has the target of significantly reducing the rate of loss of biodiversity by 2010 (UN 2002, § 42; 2006b, 6). Measures to be enhanced include establishing more protected areas (especially in "hot spots" that host a lot of species), using more environmentally sound methods in agriculture, storing seeds and genes, and protecting species threaten by extinction locally or due to trade, and sustainable use generally (Convention on Biological Diversity 1992, biodiv.org). Although there is enough food for everyone, 852 million people suffer chronic hunger, most of them in less developed countries (FAO [Food and Agriculture Organization of the United Nations] 2005). Undernutrition is implicated in more than half of the 10.5 million preventable deaths of children under 5 years that occur in low- and middle-income countries each year (WFP [World Food Programme] 2006, 3). Chronic hunger leads to undernutrition, which is associated with a much higher risk of diseases. Malnutrition does the same, according to the lack of specific nutrients like zinc, iron or vitamin A. The Millennium Target of the United Nations is to halve, by the year 2015, the proportion of people who suffer from hunger (UN 2000, § 19.1). This proportion is declining, but the number of the hungry does not. Until 2015 the target could be reached, as projections show (FAO 2006, 4). Measures are to be continued or intensified, e.g. school meal programmes, food for work projects. To assist 83 million beneficiaries in 2008 the UN World Food Programme has requested 3.9 billion $ (WFP 2006a, 5). Soil degradation and over-harvesting of fish stocks endanger important conditions necessary for life. More than 1.2 billion people and about one third of all land usable for agriculture in more than 110 countries are affected by soil degradation (MA 2005a). Soils are loosing fertility for production of food and other agricultural goods. Moreover large areas are being threatened with being turned into steppes or deserts. Causes are overgrazing, intensive or inappropriate methods of agriculture, and deforestation. Suitable plantings can improve the quality of soils. The UN Convention to Combat Desertification has initiated various action programmes (unccd.int). At least one quarter of important commercial fish stocks are over-harvested or significantly depleted. The biomass of fish targeted in fisheries has already been reduced by 90%. (MA 2005, 39, 15) In most countries of the South per capita fish consumption has declined (MA 2005, 13). 27% of fish production is coming from aquaculture. An increasing portion is produced using fish meal and hence is not a source but a sink of nutrition (MA 2005, 105). The UN has agreed on the goal of maintaining or respectively restoring stocks to levels that can produce the maximum sustainable yield (UN 2002, § 31a). Measures necessary: reduction, regulation and checks of marine fisheries, regulatory systems for aquaculture, marine protected areas (MA 2005, 21). Forests are relevant to climate, air quality, and water balance because of their high biodiversity and bioproductivity, and are also a direct source for food. 4.6 billion people depend on forests for their water (MA 2005, 29). Deforestation has increased the risk of malaria in Africa and South America by increasing habitat suitable for mosquitoes that transmit malaria (MA 2005, 114). The global area of forests has been halved over the past three centuries. In the nineties 12 million hectares of tropical rainforest get lost annually (in Africa 0.7% per year), while within temperate and boreal zones, forest cover increased by 3 million hectares per year, especially by plantations. (MA 2005, 29, 33) Net loss has decreased in the last years to 7.3 million hectares annually (equivalent to the area of Panama; UN 2006, 16). Sustainable forestry is to be extended (UN Forest Declaration 1992, label of Forest Stewardship Council, etc.). Trading of illegally felled timber has to be supervised and restricted. Poverty reduction, soil protection, and access to modern energy can open up alternatives to depletion. Recycling of paper could be expanded, and wasting of paper reduced. 44% of deliveries in countries of the South are taking place without assistance by traditional or medically skilled attendants (UN 2006, 12). Because of that every complication can become a danger for life. Many pregnant women are undernourished. Every year there are at least 3.3 million stillborns, and 2.5 million babies die as a result of inadequate conditions during pregnancy or care during birth. 529 000 mothers die during the time frame of childbirth. 68 000 of these deaths are due to unsafe abortions. (WHO 2004, 120; WHO 2005, xiv [roman 14]) Some 200 million women wish access to contraception (UN 2006, 12). Currently 300 million women are suffering from long-term or short-term illness brought about by pregnancy or childbirth, – nearly one of ten (WHO 2005, 10). Also in some industrialized countries there is an avoidably high rate of child mortality due to lack of information and health services, or laying claim to the use thereof. The UN Millennium Declaration includes the targets of reducing the mortality rate of children under the age of 5 by two thirds by 2015 and maternal mortality rate by three quarters (UN 2000, § 19.3). Furthermore universal access to reproductive health shall be achieved (UN 2006c, 6). Thanks to efforts already made, child mortality has been reduced and the portion of deliveries assisted by skilled attendants has been increased from 43% to 56% (UN 2006b, 10). The 75 countries that account for most of child mortality will need $ 52.4 billion additionally for comprehensive measures (WHO 2005, xvii [roman 17]). 80% of all diseases in poor countries involve dirty drinking water (BMZ [Bundesministerium für wirtschaftliche Zusammenarbeit und Entwicklung]). Germs in drinking water are leading to diarrhoea and other illnesses. In case of undernourishment they can have severe consequences. About 1.1 billion people don't have access to hygienic water, more than 2.6 billion are missing basic water sanitation (MA 2005, 13). This is annually leading to several billion cases of disease as well as to 1.73 million deaths (WHO 2002, 226), 68% of them children (WHO 2004, 1344, 2146). The UN agreed at the Millennium Summit to halve, from 1990 to 2015, the proportion of people who are unable to reach or to afford safe drinking water. (UN 2000, § 19 ). Furthermore the proportion of those having no access to basic sanitation shall be reduced by half (UN 2002, § 24, 7). By 2004 already 1.2 billion people have received access to basic sanitation (UN 2006, 18). Nevertheless the chance for achieving both of those targets is not good. Possible measures range from disinfection at the point of consumption to rainwater collection through to household connections to water. A finance volume of 10 billion $ per year would be needed, less than the economic damage caused by diarrhoeal diseases (UNDP 2006, 42). 1-2 billion people are currently affected by water scarcity, affecting food production, health, and economic development (MA 2005, 51). This applies especially to North Africa and the Middle East. 5-25% of global freshwater use probably exceeds long-term accessible supplies (e.g. regeneration rate of ground water; MA 2005, 106f.). Water quality, on global average, is decreasing as well (MA 2005, 43). Within less than 25 years two thirds of the world population will live in countries with water scarcity (WB 2004, 30). This also raises the risk of conflicts. The UN has agreed to stop the unsustainable exploitation of water resources by developing water management strategies at the regional, national and local levels, which promote both equitable access and adequate supplies. (UN 2000, § 23 ). The Global Water Partnership, initiated by the UN, supports countries in their sustainable management of water resources (GWPforum.org). The most important interventions to reduce this impact are better ventilation, more efficient vented stoves, and cleaner fuels (WHO 2002, 70). Appropriate stoves for nearly the half of world population would cost about 30 billion $ (ITDG [ Intermediate Technology Development Group] 2003). 112 governmental and non-governmental actors have joined together in the Partnership for Clean Indoor Air. Urban air pollution causes respiratory and cardiovascular diseases, leading to 799 000 deaths per year. 5% of all cases of lung, trachea, and bronchus cancers can be attributed to urban air pollution. The principal cause is the combustion of fossil fuels for traffic, power generation, etc. Particularly cities in Asia and the Western Pacific Region are concerned. (WHO 2002, 69, 226) The ability of the atmosphere to cleanse itself of pollutants has declined by about a tenth since preindustrial times (MA 2005, 42). Advisable measures are filtering or avoidance of exhaust fumes from vehicles, power plants, and industry, the switch to renewable energy, traffic reduction, as well as expansion of public transport and bicycle traffic. 1.19 million people die annually in road traffic (WHO 2004, 124). The global economic cost of road crashes has been estimated at $ 518 billion annually (WHO 2003, 96). Measures: safe road design, traffic management, seat belts, helmets, day-time running lights, speed limits, and restrictions on drinking while driving. Globally 20-30% of the male and 5-20% of the female working-age population have been exposed during their working lives to substances that can cause lung cancer, including asbestos, arsenic, cadmium, diesel exhaust, etc. Worldwide 10% of cancer of the lung, trachea and bronchus can be attributed to occupational exposures. Millions of workers in mining, construction, etc., are exposed to microscopic airborne particles of silica, asbestos and coal dust. (WHO 2002, 75) About 1 million people per year are dying of occupational injuries, diseases, or toxification (e.g. by airborne particulates or lead exposure; WHO 2004a, 2146). Occupational cancers are entirely preventable through hygiene measures, substitution of safer materials, enclosure of processes, and ventilation (WHO 2002, 75). Moreover the pollution of the environment by toxics and other contaminants creates a considerable risk for different species and habitats, as well as for the stability of ecosystems generally. Humans are already directly affected by increased risk of diseases, pollutants in mother's milk, and fertility loss, for example. The risks due to persistent organic pollutants and hormonally active substances are currently uncertain regarding both the extent of damage as well as the probability of occurrence. But the risks have in any case a high persistence (WBGU 1998, 66). The Stockholm Convention on Persistent Organic Pollutants of 2001 restricts or forbids production and use of 12 chemicals like DDT, polychlorinated biphenyls (PCB), and dibenzodioxins (POPS.int). The UN has agreed on the goal to achieve, by 2020, that chemicals are used and produced in ways that lead to the minimization of significant adverse effects on human health and the environment (UN 2002, § 23). The UN Environment Programme and UN Development Programme are jointly supporting countries of the South in their chemicals management, as well as with their integration into strategies for achieving the Millennium Goals (UNDP.org/chemicals). In recent armed conflicts 172 to 310 thousand people have been killed annually (WHO 2004, 124; WHO 2002). Within the 20th century there were about 191 million deaths of war, terrorism, genocide, torture and organized violent crime – and 60% of them were civilians (WHO 2002a, 21, 5). In some armed conflicts or genocides famine is used as a weapon. Famine related to conflicts has cost 40 million human lives in the 20th century (WHO 2002a, 22). Also even without deliberate, specific intent armed conflicts are a cause for hunger and poverty. Since armament has come to include weapons of mass destruction we are confronted with the danger of man-made devastation of mankind. Production and storage of NBC (nuclear, biological and chemical) weapons as well as nuclear weapon early-warning systems pose risks similar to nuclear energy facilities and large chemical facilities, but with varying probability for the occurence of damage (WBGU 1998: 73f.). The UN demanded already in 1946 the disarmament of weapons of mass destruction. The 1925 Geneva Protocol banned the use of chemical and biological weapons. In 1972 the Biological Weapons Convention, and in 1997 the Chemical Weapons Convention added the prohibition of these weapons. The proliferation of nuclear weapons is prohibited by the nuclear Non-Proliferation Treaty. A UN commission has made proposals regarding problems with implementation of the named conventions as well as the dangers of weapons of mass destruction in the hands of non-state actors. Furthermore, these proposals pointed out the necessity of achieving poverty reduction, development and climate protection as parts of a broader concept of security (UN 2004). Various global challenges make it advisable to develop and implement technologies which run with renewable and harmless substances and energy sources, thereby keeping damages and risks low. Examples are renewable energies, recycling-based economy, and bionics, as well as information and communication technology (if it minimizes the toxic content of its product components). High risk technologies include: (1) nuclear power, large chemical facilities, and dams (technologies with potential for very extensive damage but with a very low probability of the damage occurring), (2) certain genetic engineering applications as well as the release and circulation of transgenic plants (technologies with potential for very extensive damage but unknown probability of damage occurence), and last but not least, (3) any climate damaging technologies (WGBU 1998: 62). The issues of the transfer of environmentally sound technologies as well as dealing with nuclear waste were addressed in the UN Agenda 21 (UN 1992, chap. 34 and 22). To limit the risks of genetically modified organisms the UN Protocol on Biosafety was approved in 2000. Further measures in the field of technology include on the one hand the support of research, development and market launch of safe technologies (example: Renewable Energies Law), and on the other hand research on risks as well as regulation and reduction of technological risks, possibly including the prohibition of particularly risky technologies (WBGU 1998, 218, 220). Floods affect more than 140 million people per year. In the nineties over 100 000 people were killed in floods; damages of 243 billion $ were incurred. Floods comprise about half of the disasters as well as affecting half of the victims of disasters in general. (MA 2005, 54) In 2002 a total of 485 000 people died in natural disasters (WHO 2004, 122). Since the fifties annual economic losses from natural catastrophes increased tenfold (MA 2005, 9). The UN has started the International Strategy for Disaster Reduction, which has developed a Framework for Action 2005-2015 and is concerned e.g. with early warning systems and the risks of climate change (UNISDR.org). Damage to the ozone layer by fluorinated hydrocarbons and similarly acting substances was already considerably reduced by measures undertaken even before the damaging effect could be clearly proved by science. This is a success story for the application of the precautionary principle, as well as a model for mastering other global challenges. In the meantime, production and use of substances that are the main cause of depletion of the ozone layer (CFCs and FCs) have been banned, and their use almost stopped (UN 2006, 17). Nevertheless there are long-term consequences and effects to the ozone layer by pollutants that have already been emitted, although the effects can not be clearly calculated yet. There are still risks, e.g. that the ozone layer could be even further depleted in the next decades. Heightened ultraviolet radiation and the associated increase of skin cancer are to be reckoned with, particularly near the Antarctic. The recovery of the ozone layer is not expected until the mid-21st century (UN 2005). It was agreed internationally in the Montreal Protocol of 1987 and its additions to restrict or stop production and use of ozone depleting substances. This has been over 90% achieved. Problems are caused by some substitutes, inter alia regarding the greenhouse effect. The UN Goal: Countries of the South shall receive by 2010 improved access to alternatives to chemicals which destroy the ozone layer (UN 2002, § 39d). The Global Environment Facility (GEF) supports projects for the substitution of ozone depleting production processes in the South. For dwelling, clothing, mobility, etc., materials and energy are needed but will only be available in the long run, if a) in case of renewable resources they are used within the time frame of regeneration or, b) in case of non-renewable resources they are substituted by renewable ones before extraction can't keep up with demand. Otherwise there can be a strong jump of market price, which may cause economic and social difficulties. It also could force a substitution, possibly a quick and expensive one. In any case a price increase can be expected to occur before there is a physical shortage of the resource. Currently oil, steel, aluminium, and tin seem to be approaching that threshold. Scarcity of resources can lead to international conflicts. According to the UN Environmental Programme a long-term reduction of resource consumption of industrialized countries by a factor of 10 is necessary to be able to meet as well the requirements of less developed countries (UNEP 1999, 2). Germany has, in its sustainability strategy, set the target to roughly double resource productivity from 1990/94 to 2020 (Bundesregierung [Federal Government of Germany] 2002, 93). Besides substitution and saving there are other approaches for increasing resource productivity or resource efficiency: dematerialization, miniaturization, as well as durability and reusing of products respectively components, and also recycling of material. In order to overcome the global challenges several capacities for action can be used or built up, which can contribute to practical progress: cooperation in partnerships by persons and/or institutions, enterprises or organizations; the civic commitments of persons or the "corporate citizenship" of enterprises or institutions; the options for democratic participation in public affairs including transparency and good governance. The Agenda 21 and the Millennium Declaration of the United Nations rely on the principle of cooperation and commitment of different actors on different levels as well as from different social factions and fields of work (UN 1992, 2.1, 23; UN 2000, § 20). By means of this cooperation the participants establish comprehensive tasks within their activities. The Millennium Goals include for example the building of a global partnership for development. Partnerships are increasing, and the number of parliamentary democracies is also increasing as are the institutional, social and technical possibilities for participation. Capacity building also includes access to information and education. That enables the analysis of problems and informed influence of politics and markets as well as decisions about lifestyles. That also assists in getting new solutions in research and development off the ground and thereby shaping our paths to the future. For good reasons the UN Agenda 21 and the Millennium Declaration place value on strengthening education and science along with the role of private business and information technology (UN 1992, 30, 35, 36). Hence one target is, by 2015, to ensure that … children everywhere, boys and girls alike, will be able to complete a full course of primary schooling – to date 86% of the children in the South now go to primary school. Furthermore, the benefits of information and communication technologies shall be available to all. (UN 2000, 19.2, 20.5) There is still a "digital divide". In the North over 50% have an Internet access, in the South only 7% (UN 2006, 6, 25). FAO 2005 – Food and Agriculture Organization of the United Nations: „Achieving Millennium Development Goals requires increased funding“. (9/2005). FAO 2006 – Food and Agriculture Organization of the United Nations: The State of Food Insecurity in the World 2006. IPCC 2001 – Intergovernmental Panel on Climate Change: Climate Change 2001: Synthesis Report Summary for Policymakers. UN 1992: Agenda 21. United Nations Conference on Environment and Development, June 1992, Rio de Janeiro. UN 2000 – UN General Assembly: United Nations Millennium Declaration. UN 2002 – World Summit on Sustainable Development: Plan of Implementation. UN 2006c: Report of the Secretary-General on the work of the Organization. General Assembly, Official Records, Sixty-first Session, Supplement No. 1 (A/61/1). UNAIDS 2005: US$ 22 Billion Needed in 2008 to Reverse Spread of AIDS. Press release, Geneva, 21 June 2005. UNDP 2006 – United Nations Development Programme: Halting the spread of HIV/AIDS. WB 2004 – World Bank: World Bank Atlas 2004. WB 2005 – World Bank: Global Economic Prospects. WB 2006 – World Bank: World Development Report 2006. WFP 2000 – World Food Programme: Executive Board Annual Session, Rome, 22-26 May 2000, Policy Issues, Agenda item 4 (Follow-up to the World Food Summit). WFP 2006 – World Food Programme: Ending Child Hunger and Undernutrition Initiative; Global Framework for Action: Summary Note; Informal Consultation on the Ending Child Hunger and Undernutrition Initiative (ECHUI). Rome, 9 October 2006. WFP 2006a – World Food Programme: 2006 Estimated Needs and Shortfalls for WFP Operational Activities. 1 November 2006.